The Cartoon Cave: Happy Birthday, Jim Garner! As you may have noticed, this blog has been pretty inactive for awhile. In fact, it's been inactive for exactly one year, as my last entry was also in celebration of James Garner's birthday! Well, be that as it may, here is my latest caricature in tribute to my all-time favourite actor. 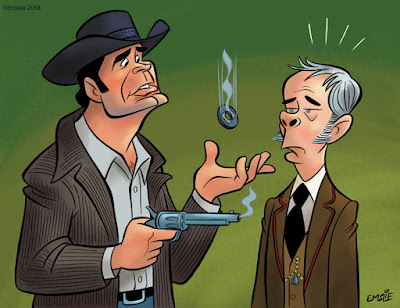 I've always loved Jim's 1969 comedy western, Support Your Local Sheriff, so I thought I'd revisit that film with my cartoon interpretation of the scene where Jim's character, a drifter named Jason McCullough proves himself worthy of accepting the position of sheriff to the town Mayor, played by that wonderful character actor, Harry Morgan. Of course, TV audiences from that time will fondly remember Harry Morgan from two hit series of the era: as Officer Bill Gannon, the partner to Sgt. Joe Friday on Dragnet, as well as his long-running role on M*A*S*H as the gruff yet loveable Colonel Sherman Potter. In this scene, Jason McCullough attempts to prove to the town officials his marksmanship by tossing a metal washer up in the air and shooting a bullet through the hole in it. Unconvinced that the bullet passed through the hole, Mayor Perkins places a piece of tape across the hole and asks him to do it again. When the washer comes down with a hole clear through the tape, the Mayor realizes he's dealing with a professional gunslinger and appoints Jason the job of town sheriff. Luckily, that very scene is available to view on YouTube in this video clip. Enjoy! Labels: caricature, Harry Morgan, James Garner, Support Your Local Sheriff!